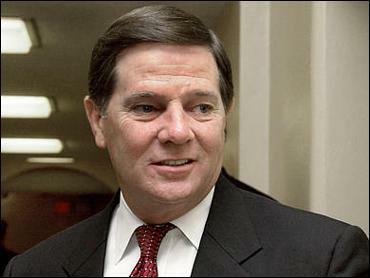 A Texas Democrat who is losing his House seat because of redistricting engineered by House Majority Leader Tom DeLay is filing ethics complaints against the Republican leader. Rep. Chris Bell is charging that DeLay, R-Texas, provided legislative favors to a company that made campaign contributions to DeLay and other Republicans, laundered other corporate donations to illegally help Texas GOP candidates and improperly used his office in asking the Federal Aviation Administration to track down a private plane used by Texas Democrats. "The charges are very serious and well documented," said Bell's spokesman, Eric Burns. DeLay, at a news conference Tuesday, discounted the complaints as frivolous, saying Bell was bitter about losing his seat. "To misuse or to use the ethics committee for political purposes demeans the House, undermines our ability as an institution to carry on the people's business," he said. "It creates personal animosities that I think are really unfortunate." Bell's charges would be the first filed against a House leader since the ethics committee took up a case against former Speaker Newt Gingrich in 1997 that contributed to his decision to leave office. Since then there has been an unspoken truce between the two parties on filing ethics complaints. Bell's complaints center around three issues: first are memos from Kansas-based Westar Energy, written in 2002, implying that donations of $56,500 to political committees associated with DeLay and other Republicans would win the company benefits in the crafting of legislation. Second, Bell says that the Texans for a Republican Majority Political Action Committee created by DeLay had given $190,000 in corporate donations to the Republican National Committee, which in turn gave that money to Texas GOP candidates, an action that would be illegal under Texas law. Third, he says DeLay abused his office in asking the FAA to track down the plane thought to have been used by Democrats who last year left the state to prevent Republicans in Austin from approving a controversial redistricting plan backed by DeLay and favoring Republicans. That plan was eventually approved and Bell, a freshman, saw his district placed in a new district that was heavily Democrat but far more racially diverse, with whites comprising only 21 percent. Bell, who is white, was defeated in the Democratic primary by former Houston NAACP president Al Green. Burns said that Bell had made the decision to file the complaint on his own. He said Democratic leader Nancy Pelosi and other Democratic leaders were notified, but did not influence his decision. The ethics committee, or Committee on Standards of Official Conduct, has five legislative days or 14 calendar days to determine whether the complaint meets criteria for being considered. If it is accepted for consideration, the chairman and top Democrat on the committee have 45 calendar days to make a recommendation to the committee, establish an investigative subcommittee or ask for more time.